The Tuli-Block region is home to a diverse range of wildlife and you are sure to have good sightings of Elephant, Eland and Lion whilst on safari. The Tuli Block is a series of privately-owned farms, lying on the border between Botswana and South Africa. 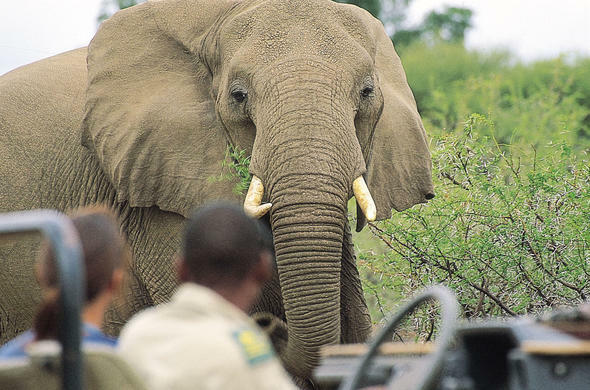 Many are private game reserves supporting a wide variety of wildlife. The best-known of these reserves are the Mashatu and Tuli Game Reserves. Tuli plays host to an impressive array of animals. The plains for one are home to vast numbers of Wildebeest and Zebra while the rest of the region plays host to a variety of antelope and troops of Monkeys. Among the giants of the region are massive African Elephant, Eland and Giraffe while the predator count includes Lion, Cheetah and Leopard. Also present in the area are the unusual Aardvark and Aardwolf, the Spotted Hyena and the Jackal. The reserves antelope range from the huge and gregarious to the small and solitary. In the Tuli area the Steenbok and the Duiker hold a significant cultural and tribal relevance as they are seen as good luck animals with the duiker further being a totem to traditional culture.Africa's largest antelope the Eland is commonly seen in small herds in the Tuli region. In the Tuli region Eland migrate a lot in search of water and food, having to cross the dangerous Shashe River between Botswana and Zimbabwe where they often fall prey to crocodiles. They are also preyed upon by the local predators along the way such as Lion and Hyenas. They tend to stay together to help prevent this, keeping the young within the herd in a tightly knit group for safety. Eland are ox-like in appearance, with a thick neck and heavy dewlap is easily tamed with a tame group being fairly common on Zimbabwe farms. The usually slow moving Eland tend to have instinctive speed and spring when required to flee, and can keep up their pace over considerable distances. They make a distinctive clicking sound from their hooves and can weigh up to 900 kilograms. Eland are rather fond of the leaves and pods of Mopane trees and herds in Tuli consist of both the tan-coloured common Eland and the northern, Livingstone's Striped Eland. The males tend to lose fur and turn a bluish colour with age. The Bushmen of Tuli particularly revere the Eland and have depicted them for centuries in their rock art, making them an integral part of what makes up the wildlife of the Tuli area. The Tuli is also known as the Land of the Giants because of the incidence of ancient baobabs, tall cliffs and herds of elephants. It is here where the wild Africa of legend stirs. It is a land that has experienced most of Africa's human history - from tribal conflict to settlement and through to exploration - with the echoes of all these endeavours to be found in the area. Apart from the elephant and baobabs the Tuli Block is also the home of the tallest mammal, the giraffe, the largest bird, the ostrich and the largest antelope in the eland. Africa's heaviest flying bird, the kori bustard is also found in the Tuli.Apart from a great game experience the Tuli also offers one of the most sought after birding safaris with more than 350 species having being recorded. It is not the number of species though that sets Tuli apart but the species themselves. Dry-land species are found side by side with waders and other water birds. The geography of the Tuli area is in stark contrast to that of the more famous northern parks of Botswana. In the north the white Kalahari sands dominate and there are very few hills whereas in Tuli the earth is red and rocky, with hills and outcrops filling the landscape. The great diversity of Tuli can be experienced by game drive, night drive, on foot, on horseback and by bicycle. Special bicycle trails take you close to a variety of wildlife. The Tuli may not be as well known as the northern parks of Botswana but it can certainly hold its own against these icons.